Comments on this latest round of proposed well control rules must be received by BSEE by 10 July 2018. More details can be found here. On 26 April, the BSEE Gulf Coast Regional Office hosted a meeting with industry stakeholder at the offices of Pacific Drilling in Houston to address the requirements of 30 CFR 250.733, What are the requirements for a surface BOP stack? Contained within this regulation is a requirement that blind/shear rams be capable of shearing tubing with exterior control lines including electric, wire and slick line under MASP beginning 30 April 2018. Industry and BSEE have acknowledged that equipment necessary to satisfy this requirement is not yet available. The purpose of the meeting was for BSEE to listen to industry comments, thoughts and ideas for satisfying this requirement via equivalent means. At the conclusion of the meeting, BSEE determined equivalency proposals would be evaluated on a case-by-case basis until a permanent solution can be achieved. Specific questions regarding the issue can be addressed to Fred Brink at fred.brink@bsee.gov or Earl Shanks at earl.shanks@bsee.gov. The U.S. House was eager to move forward with the Farm Bill Reauthorization Act in May, but unfortunately for House leadership, the bill did not garner enough support on final passage. It is expected the House will attempt to take the bill back up in June. The House did pass the National Defense Authorization Act (NDAA) and the bill has now been sent to the Senate. An amendment was proposed to permanently ban Eastern Gulf of Mexico oil and natural gas development, but the amendment was not approved by the Rules Committee. However, a provision was included to bar the Fish and Wildlife Service from listing the greater sage grouse and lesser prairie chicken under the Endangered Species Act for 10 years. The U.S. Senate is still busy processing nominations, including confirmation of Gina Haspel as the first female CIA Director. The Senate also voted to disapprove or overturn the FCC’s regulation related to ‘net neutrality’. The Senate is expected to return from their Memorial Day recess to process more nominations, along with possible consideration of the Water Resources Development Act (WRDA), NDAA. Other items on the horizon include: Flood Insurance Reauthorization Bill, which expires in July, and the FAA and the Farm Bill authorizations which expire in September. Tariffs are the highlight of May for the Administration – from the lingering steel and aluminum tariffs to an announcement to levy tariffs on Chinese goods, to ongoing NAFTA negotiations, the Administration is being aggressive on the trade front. In addition, President Trump signaled he is pulling out of the Iran Nuclear Deal and there are on and off again talks with North Korea. SafeOCS recently made its 2017 Annual Report on Oil and Gas Production Safety System Events available. The SafeOCS program is a resource for industry members to share key observations and lessons from equipment and safety-related events and is administered by the U.S. Department of Transportation Statistics. It’s objective is to identify potential high-consequence risks from aggregated, industry-wide data and share findings with the industry to mitigate risks. BTS first began collecting data on equipment component failures as required by BSEE’s Well Subpart H- Oil and Gas Production Safety Systems Final Rule in December 2016. In 2017, the first full year of mandated Safety & Pollution Prevention Equipment (SPPE) incident reporting, 9 of 59 production operators in the Gulf of Mexico reported 112 failures. The remaining 50 operators did not report any failures. None of the reported SPPE events were associated with an HSE incident. The full report can be accessed via the SafeOCS website. The U.S. Pentagon recently released its report on Preserving Military Readiness in the Eastern Gulf of Mexico, which outlines its concerns and possible implications for preserving the Department of Defense usage of the area. Written in response to Congressional House Report 2018, The National Defense Authorization Act for Fiscal Year 2018, the report concludes that due to the unique advantages the Eastern Gulf of Mexico provides, which includes decades of regional infrastructure investment, permitting the expansion of oil and gas activities into this area without close collaboration between the Department of Defense and the Department of Interior would detrimentally affect the capabilities and readiness of military forces. On 10 May, OPITO, in partnership with Robert Gordon University’s Oil and Gas Institute, released the UKCS Workforce Dynamics Review. The review assesses the changing skills requirements for the industry over the next 20 years and the research contained within it will assist in providing ga roadmap for a new skills strategy to ensure the sector is ready to take advantage of emerging roles and diversification opportunities. The research indicates that more than 40,000 new workers will need to be recruited into the industry over the next 20 years, which would include 10,000 positions not yet in existence, including data analytics, date science, robotics and remote operations. Other findings in the report project that 80,000 workers will likely retire or leave the industry by 2035. More details can be found at OPITO’s website. IPIECA-IOGP recently released the 2017 data for the health performance of their member companies. Based on the original survey criteria contained in the 2007 Report 393, Health Performance Indicators – A guide for the oil and gas industry, data was collected for 2017 from 29 participating companies with the intent to assess health performance within individual companies and compare performance between different part of a company and between participating companies. Each company was allowed to review its own data while comparing with the results of other participants. Despite the variation in participating companies across five years of surveys, the average values for health area assessed have remained consistent. The full report can be downloaded on IPIECA’s website. On 8 May, Scott Tessier, Chair and CEO of the Canada-Newfoundland and Labrador Offshore Petroleum Board (C-NLOPB) addressed the National Advisory Panel on Marine Protected Area Standards. In his comments, he affirmed C-NLOPB’s support of Canada’s commitment to the protection of the marine environment and stated that future proposed oil and gas activities will continue to elicit an appropriate level of consideration for mitigations and restrictions necessary to meet conservation objectives. His full remarks can be accessed via the C-NLOPB website. On 14 May, APPEA released its 2018 edition of Key Statistics. Information provided in the report includes a consideration of supply & demand, economic contributions of industry, capital investment facts and safety performance statistics. The full report can be accessed via APPEA’s website. On 23 May, the UK Oil and Gas Authority (OGA) announced an offering of 123 licenses over 229 blocks or part-blocks to 61 companies in its 30th Offshore Licensing Round. The offering makes a total of 26,659 km available for award and represents an intent to increase existing acreage held by 50%. OGA anticipates that this round’s offerings will encourage development of a dozen undeveloped discoveries comprising an estimated 320 million BOE. More details can be found on the OGA website. On 24 May, Industri Energi, Norway’s offshore drilling labor union, announced it had struck a new deal for its more 4,000 members. The union stated that the agreement likely averted a strike that may have affected offshore activities later this year. The Norwegian Shipowners Association stated a similar agreement has also been struck with the smaller Safe Union. On 22 June its members will vote on whether to accept the deal as the terms are not as favorable as originally sought. On 15 May, the IADC North Sea Chapter celebrated its 45th anniversary. Current and past chapter committee members were invited to attend a gathering to share reminiscences and stories from the past 45 years. 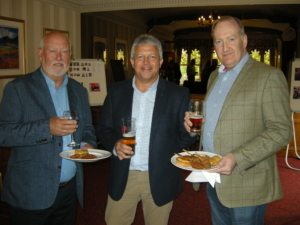 From Left: John Atkinson, past NSC Chairman and former IADC Regional Representative; Gavin Sutherland, KCA Aberdeen, Former NSC Chairman and Pete Wilson, Rowan Companies, current NSC Chairman. 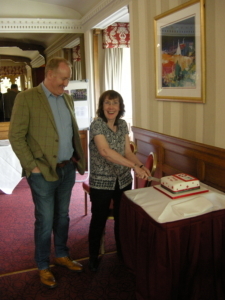 Edith McLeod, current NSC Administrator and Pete Wilson, current NSC Chairman, cut the 45th anniversary cake during the 18 May gathering of current and former IADC North Sea Chapter members. The IADC Executive Committee recently voted to promote the ART Cybersecurity Subcommittee to a full Committee. Siv Hilde Houmb, Secure-NOK will continue in her role as Chair and Juan Negrete from Rowan and Ben Ramduny from Seadrill have accepted the role of co-chairs of the new Cybersecurity Committee. More information about the Committee, including upcoming meeting dates, can be found on the IADC Cybersecurity Committee webpage. 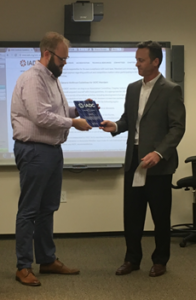 Brad Green was recently recognized for his leadership of the IADC Manufacturing Record Book (MRB) Subcommittee. He took over leadership of the subcommittee in 2017 and under his leadership, the subcommittee released Revision 1 of the MRB Guidance document. Through continued collaboration with drillers, OEM’s and Classification societies, Mr Green positioned the MRB Subcommittee to publish a second revision to the original guidance document, which is due for publication in late 2018. On 12 April, the IADC Cybersecurity Committee hosted a cybersecurity workshop in Stavanger, Norway sponsored by Secure-NOK and Rowan Companies. More than 30 people attended the workshop, to discuss legislative and standardization activities, guidelines for network segmentations, automation systems and cybersecurity integrity and risk management, the NIST cybersecurity framework and the IADC Guidelines for Cybersecurity for Drilling Assets among other topics. The group then toured the ULLRIGG Drilling and Well Centre. 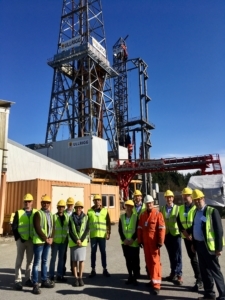 On 12 April, attendees from the Cybersecurity Workshop were invited to tour the ULLRIGG Drilling and Well Centre. The IADC Drilling Engineers Committee’s 13 June Technology Forum, “The New Age in Drilling”, sets its sights squarely on how the generational changing of the guard impacts development of new technology, refinement of business models, and the perspective of drilling professionals. With the long-anticipated “Big Crew Change” dawning, many of the drilling industry’s grizzled, white-haired veterans will fade into the sunset, replaced by a younger generation with perhaps significantly different attitudes and aptitudes. What will be the impact on drilling operations, HSE, and technology? The event is hosted by National Oilwell Varco at its facility at 10353 Richmond Ave in Houston, from 08.00 until noon. Lunch will be provided by NOV. The tech forum will be held in the first-floor auditorium. (Parking is in the multi-story garage at the rear of the building.) Note: This is a different facility from previous DEC events hosted by NOV. The agenda features five up-and-coming drilling technologists to present their perspectives on technology, decision making and more. In lieu of individual Q&A, the speakers will participate in a panel following all presentations. The goal of the Tech Forum is to foster a discussion on how industry is responding to these challenges and what improvements and strategic direction the new generation envisions for it. In addition, spokespersons for DEC joint industry will provide updates on their work, and we will hear a new JIP proposal. Each speaker will make a 20-minute presentations. Please hold all questions until the end of all presentations, when the five participants will engage with the audience as a panel. There will be a break at 10.10-10.25. To register, go to https://store.iadc.org/committee-meetings?meeting=13JUN2018DECTF . Please note that IADC has a new ecommerce system. If you experience technical difficulties, please contact IADC at membership@iadc.org or webmaster@iadc.org, or by calling 713.292.1945. On 4 April, IADC Cybersecurity Chairman Siv Hilde Houmb with Secure-NOK, Melissa Mejias, Legislative Analyst, IADC and Sean Plankey with BP met in Washington D.C. with the U.S. Coast Guard and the National Institute of Standards and Technology (NIST) to discuss the “Guidelines for Minimum Cybersecurity Requirement for Drilling Assets” published by IADC earlier this year. The group also discussed the NIST Cybersecurity Framework Offshore Operations Profile and draft Navigation and Inspection Circular (NVIC) 05-17; Guidelines for Addressing Cyber Risk at Maritime Transportation Security Act (MTSA) Regulated Facilities. While in Washington, D.C. the group also met with the Senate Commerce, Science and Transportation Committee to discuss S.2083: Strengthening Cybersecurity Information Sharing and Coordination in our Ports Act of 2017. The bill would instruct the Department of Homeland Security to take steps to boost cyber information sharing and coordination at U.S. ports in reaction to a “notPetya” cyber attack at the Port of Los Angeles. IADC has not supported the language included in the bill. The Senate Committee has previously been visited by other trade organizations with similar concerns and does not plan to move the bill forward until concerns raise by industry have been addressed. IADC will continue to work with both the Committee and the Coast Guard to ensure the bill does not move forward until is has been amended. For more information about these issues, please contact Melissa Mejias at Melissa.Mejias@iadc.org. Call for abstracts for IADC Spark Tank on 16 August: Meet the Sharks! The IADC Advanced Rig Technology Committee has issued a call for abstracts for the ART Spark Tank, scheduled for 0900-1130 on Thursday, 16 August, at IADC headquarters in Houston, Texas. The deadline for abstracts is Friday, 29 June. Note the change in date for the Spark Tank – 16 August is the new date, replacing 30 August, the old date! IADC ART welcomes abstracts on any new technology that will improve efficiency or safety in well construction. The purpose is to provide insights (“Sparks”) to technology developers into what matters to those they are innovating for. There is sometimes a vast disconnect between a good idea and a great product, and this series will attempt to close that gap in a good-natured, productive manner. The Well Control Institute (WCI) Board of Directors has approved the publication of a whitepaper developed by the WCI Competency Workgroup titled “ The Status and Future of Well Control Competencies.” The purpose of the paper is to state WCI’s position on the current state of well control training in the oil and gas industry, and to offer recommendations on how it can be continuously improved. This whitepaper represents nearly two years of work by the group, beginning with an initial assessment of IADC/IWCF compliance with IOGP 476, creating the competency workgroup, the well control training survey and analysis, recommendations for continuous learning practices, and finally the paper. This project, sponsored by Andy Krieger of BP and chaired by Charlie Holt of BP, was initiated as part of WCI’s efforts to review industry efforts relevant to competency in the industry. Competency is the highest-ranking priority topic identified by the Board as a relevant factor in improving well control performance. In a letter sent to IOGP, IWCF and IADC, WCI Chairman expressed his thanks to Mr. Krieger, Mr. Holt, and many others on the workgroup who developed the paper. “The type of collaboration exhibited here exemplifies the spirit of WCI of an industry working together to have a positive impact on well control performance,” Mr. Dew said. The paper can be found in the Documents & Resources section of the WCI web site at www.wellcontrolinstitute.org. For more information, contact Steve Kropla at ext. 211. All meetings are held from 9 to 10:30 a.m. at COGCC’s Denver office unless otherwise noted. The next meeting is scheduled for June 19. The IADC BOP Controls Subcommittee of the IADC Advanced Rig Technology Committee (ART) has published the first version of the “IADC Control Valve Qualification Testing Recommendations”. The recommendations are designed to help improve reliability of hydraulic control valves by providing, within a single document, supplementary requirements for design qualification testing of specified types of BOP control valves. These recommendations are intended to provide guidance to improve safety, reliability, and performance of BOP Controls. Version 1.0 specifically covers SPM and shuttle valves. This evergreen document will be continually supplemented with recommendations for qualification testing for additional critical valves. Purchasers of version 1.0 will receive future updated versions at no additional cost. The 11-page recommendations are available to members at $50, and are list-priced at $65. Computer containing hidden software that enables the machine to be controlled remotely, usually to perform an attack on another computer. Weatherford Drilling Int’l: Rig 173 (2); Rig 802 (1); Rig 815 (1); Rig 840 (2).